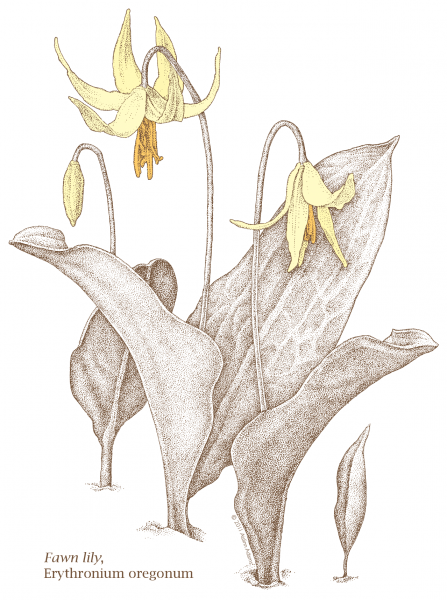 Habit: herbaceous perennial that produces bulbs. The two thick tongue like leaves that grow from the base of the plant that can reach 8 in (20 cm) long. Those leaves are dappled with irregular brown markings, similar to those on a fawn. A single leafless stalk about 12 in (30 cm) tall produces1-3 slightly nodding flowers that are creamy white, with tepals that flare outwards revealing yellow stamen. Flowers grow to 2 in (5 cm) long and bloom from early to late spring. 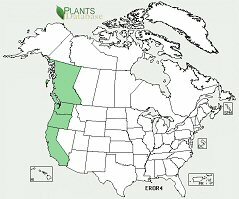 Ecology: found only in the Pacific Northwest west of the Cascades in moist forests, and rocky meadows at low elevations. Growing Conditions: full sun to full shade, moist, well-drained soil with high organic content. Often self sows forming showy colonies over time.